Suddenly in the midst of the Texans although the centre of attention I feel rather small…. Another fine hot sunny day here at Bellaugello Gay Guest House, guests have departed breakfast and whilst I wait for the fig jam to cool enough to allow me to put it into the waiting pots I took the time to photograph our terrace bathed in the fine August sunshine. It’s that time of the year again. 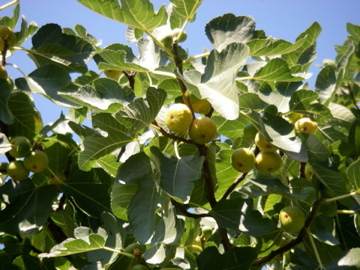 Having shed the June fig crop owing to the lack of rain in the spring this year the gigantic fig tree in the gardens here at Bellaugello Gay Guest House is laden with September figs – the second crop of the year. Although the fruit are physically smaller than the first crop the figs are plentiful and juicy and very sweet. So for me it is off to harvest and then into the intense heat of the kitchen to make fig marmalade for the guests’ breakfasts…. 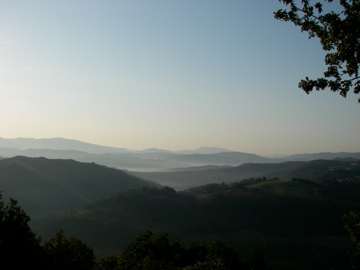 The weather here in Umbria seems to be getting hotter and hotter. Last week guys were in Spoleto, the wine town of Montefalco and Assisi and Perugia and all reported soaring temperatures. Here at Bellaugello the temperatures are in the high 30ºs, but thankfully there is a light breeze. Friends telephone, they are running out of water, it has rained little this summer. 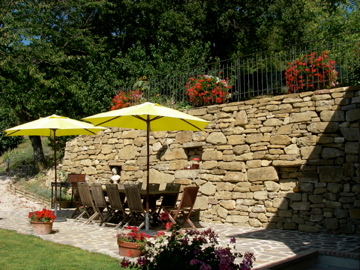 Thankfully here at Bellaugello Gay Guest House the spring is still flowing and we are able to keep the gardens watered. 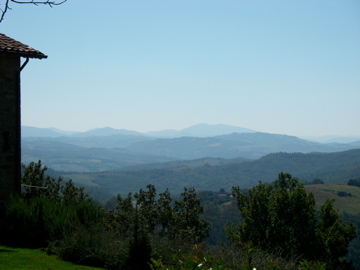 Our little corner of Umbria is still green. Yesterday afternoon as I prepared to steal a quiet half hour at the poolside a large black cloud appeared as if from nowhere and within five minutes, whilst all around was blue, the cloud burst and it rained heavily, the wind picked up it was like a tropical storm. Half an hour later normality had returned and the sun shone again, the air fresh and clean, and the gardens watered, but alas too late for my pool time – there is always today! Strange thing the rain was very localised, not a drop three km south of here or in Gubbio. We have just finished cutting and baling the second cut of hay which is lying in great round bales in our fields, luckily the bales are resistant to such a short burst of rain and no harm was done, only benefit. Recently the skies above Bellaugello Gay Guest House have been a clear azure blue. There are light wisps of clouds that give passing shadow, a slight cool from the hot summer days, it is a time for relaxing… or being adventurous! However just occasionally the peace as been disturbed by one of my good neighbours who has a small factory building microlites or ULM. 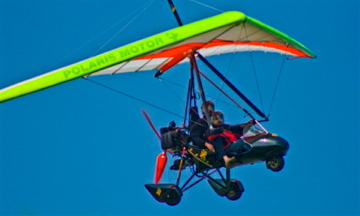 Aimaro is a brilliant pilot and qualified instructor, and just occasionally flies his craft over us here at Bellaugello. A couple of early departures meant I was awake early enough this morning to catch the sun breaking through the light mist still lingering on the hillsides here in Valdichiascio.